Dec. 7, 2017 marks the 76th anniversary of the Japanese attack on Pearl Harbor. 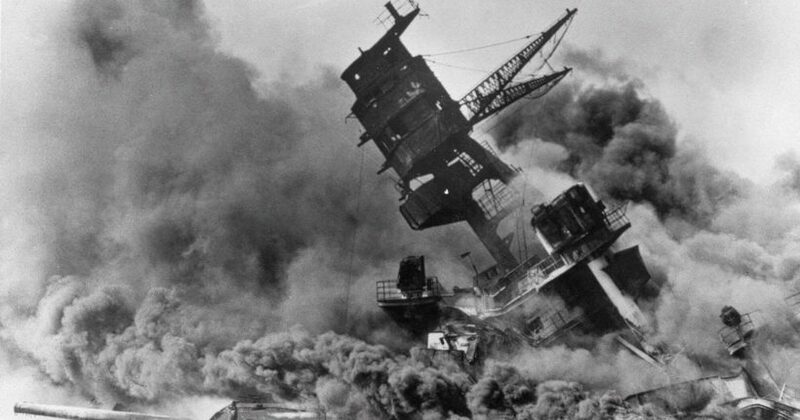 For photos of Pearl Harbor and the attack, go to the U.S. Navy’s history website at history.navy.mil. The USS Arizona Memorial, built over the remains of the ship, now forms a centerpiece of the World War II Valor in the Pacific National Monument, an historic site administered by the National Park Service. Visit the National Parks Service website for the USS Arizona Memorial at nps.gov. 1. Tone is the attitude a speaker or writer takes towards his subject: the tone can be serious, humorous, sarcastic, ironic, inspiring, solemn, objective, cynical, optimistic, critical, enthusiastic…etc. Which word do you think best describes the tone of FDR’s speech? Explain your answer. 2. The purpose of an editorial/commentary (or speech in this case) is to explain, persuade, warn, criticize, exhort, entertain, praise or answer. What do you think was the purpose of President Roosevelt’s speech? 3. Why is it important for students to learn about Pearl Harbor? 4. Ask a grandparent what he/she learned about Pearl Harbor in school.